Absolutely unique and the ultimate hideaway, a dramatic fortified farmhouse in a stunning untouched region of Spain. Pool, hot tub, games room. Plenty of activities nearby, full concierge service. 10 bedrooms, 9 bathrooms, sleeps 25, heated pool, games room, BBQ, stunning views, partial aircon. 5 mins drive to St Pere de Ribes, 40 mins to Barcelona and 10 mins from Sitges beaches. 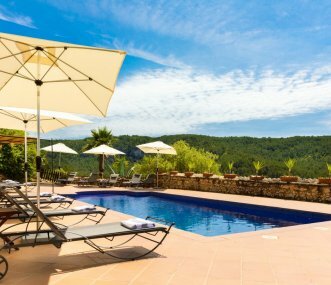 Stunning county house with 2 pools and beautiful views set in the Garraf National Park but just 15 minutes from the popular resort of Sitges and 40 minutes from the vibrant city of Barcelona.